The on again, off again saga of the Evergreen Line gets stranger and stranger. The Mayors – those people that the Provincial Government thinks are not competent to run local transit in Metro Vancouver (although they do everywhere else in BC) – have made a very sensible recommendation. Since there is now not enough money to build the Evergreen Line as a SkyTrain extension, why not go back to Translink’s original plan and build it as light rail? This would save $400m – which is pretty much the shortfall currently needing to be filled. But provincial Transport Minister Shirley Bond will not hear of it – and neither will the federal government. And, of course, it is the provincial government that is refusing to allow Translink the new funding sources that they need to pay for their share of the capital cost of the project – plus of course its on going operations and maintenance. TransLink CEO Tom Prendergast told the board he has heard suggestions Ottawa might pull its funding for the Evergreen Line if federally preferred SkyTrain technology was abandoned or if the project takes too long to move forward. If they put this in a tv sit com it would stretch credibility. Actually, I would not be at all surprised to hear that the feds are going to start looking for ways to get out of some of their commitments, given the unprecedented size of the deficit – but so far that has not happened – and all we have are “suggestions” from an unidentified source. So the reality may be different. The process by which LRT was originally chosen for this line – and its route – was actually very unusual for BC. It was a completely objective, technical review run by staff (actually Clark Lim, who is now at UBC) and there was no political interference. Until the decision was announced, which is when the amazing, and actually tendentious, claim was made that the SkyTrain premium was not significant and the benefits of not having to change trains at Lougheed were well worth paying extra for. If there was any objectivity in this process, or any respect for local democratic decision making, then the senior levels of government would say, yes we recognize that there is a funding problem which we cannot resolve so we agree that a scope reduction to LRT is a reasonable way to get this thing built. But that is not the case, as is obvious when you read the blethering that Jeff Nagel is now reporting. It is a very good illustration of that old saw “the best is the enemy of the good”. The most likely outcome of this disagreement is that nothing at will get built and the arguing about whose fault that is will continue interminably. Heaven forbid that we actually do something with rapid transit in this region that not only fits in with the agreed regional strategy but actually makes some sense. Jeff Nagel in the Richmond Review does his best to make Mary Jo Porter’s address to Translink mayors controversial, but really it is anything but. She is not saying anything new, or that is not well known – in fact this issue has been the central one for transit in this region for as long as there has been transit. You cannot have transit oriented development unless there is transit there to make it work. Kitsilano did not become a desirable residential neighbourhood until the streetcars started running. And when they first appeared they ran through a very empty area – which quickly started to fill up as houses sprang up almost like mushrooms overnight. However that was back at the beginning of the twentieth century when cars were a novelty. Fifty years later, growth started to spread out as more and more people bought into the concept of a single family home on its own lot with a garage, and everything within a 20 minute drive – not the 20 minute walk that identifies TOD – or “New Urbanism” or what cities had looked like for most of human history before cars. The post war history of North America has been one of growing disenchantment with the American Dream. The history of the twenty first century is going to be about how succesful (or not) we are at waking up from that dream and dealing with reality. We cannot afford to live the way that the corporations have been trying to persuade us to buy. It has made us sick, and it exceeds the carrying capacity of the earth – which is the only planet we have found so far that is capable of supporting us. We do not have anywhere else to go – yet if everyone on earth lived like we do, we would need four planets. Greater Vancouver (as it then was) understood this quite well fifteen years ago, when it was agreed that we needed a region that was compact, conserved resources and gave us more choices. Unfortunately, the politicians we elected do not serve the voters – they serve the people who pay for their election expenses – or rather the corporate interests that now decide policy at all levels of government and do not tolerate any opposition. Joe Trasolini, Mayor of Port Moody, has made it clear that his community, that embraced greater density ahead of rapid transit expansion, can no longer absorb any of the population growth planned for it, since it still does not have transit. Communities south of the Fraser also now clearly understand that, despite provincial propaganda to the contrary, there will be no transit for them either. So the next million people who come here better be able to figure out a way to afford to run a car, as they will not have any other way to get around in the new neighbourhoods that will be built. Because no one else is following Port Moody’s example – and anyway the freeway is getting widened – and the perimeter roads built – long before any transit system expansion that way. There will be some more transit – just not very much and all of it in places that can support it. It will be very expensive indeed – inserting any kind of transit into developed areas always is. That is the rationale being followed by the province – and it is a recipe which has so far failed and will continue to fail. The mayors and TransLink want the province to deliver new funding sources – like road pricing or regional tolling – to finance the $450-million expansion, without which they say they can’t afford to build and run the Evergreen Line or other rapid transit expansions in Surrey and Vancouver. Victoria has so far refused and that unfunded scenario will be off the table Oct. 23 when mayors vote on the new 10-year plan. This is why I have said – and continue to say – that SoCoBriTCA is a creature of the province. The mayors have very little say – and now the province will only allow them two choices – stasis or cuts. The province has gone quiet about its “$14bn transit plan” since that is what Translink would need an extra $450m a year to maintain and operate. The $14bn (which included the Canada Line) was always based on two other levels of government paying equal shares – and neither has any intention of so doing. And the only argument right now is how to pay for the Evergreen Line (which serves an area pretty much built out now) and then the tube under Broadway to UBC through an area where talking about greater density is equivalent to spitting in church. TransLink doesn’t have direct responsibility for achieving climate change targets, it has inadequate tools to do the job and its proposed plans are basically ineffective on that front. Local cities wield far more influence in shaping growth and reducing car trips through smart growth policies, she said. But no city is going to adopt smart growth policies if it does not have the infrastructure in place to support it. What we have now is a system which requires developers to pay for most of the infrastructure themselves – and thus it is the people who buy into the new subdivisions who pay for the new roads, sidewalks, sewers and so on. 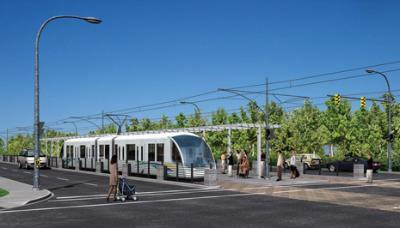 Electric powered, rail based transit – which is what we need for smart growth – is far too expensive for a developer to pay for, especially since it will be running empty for the first few years. That model has been rejected by investors since they have become convinced that if that is what society wants then it has to come from taxes. Of course, before mass car ownership, rapid transit in North America was mainly a private sector enterprise, funded mainly by the simple rise in land values brought about by the change in land use from agriculture to residential and commercial. The reason why transit does not get the government funding is that it has already been commandeered by the automobile lobby. In this region billions are earmarked for new and widened roads – and most of this will be borrowed by a government already deep in debt. While cuts to everything else have been savage, highways have been sacrosanct. Of course there is a choice. There always was a choice. But that choice has been made for us – and not in our best interests – and now all that is left is for our representatives to decide if we will have a poor transit system at much higher cost to us or a dreadful transit system at a slightly reduced cost. No one is allowed to even talk about what we might be able to achieve if we did what was once done, and done successfully, and made Vancouver’s streetcar suburbs the most desirable place to live. About how we could even revive the old tracks that are still there – and how many other cities have done exactly that and achieved results we can only envy. Because a few men in Victoria, doing the bidding of a small select few, very wealthy individuals – who like to think of themselves as “the elite” – have determined that there is more money to be made from the same ponzi schemes that brought about our present troubles. The present controversy is a sham and a sideshow. Gordon Campbell has forgotten all about the need to reduce greenhouse gas emissions, and whether or not better transit in Metro produces a small saving or a negligible one makes no difference to anything. BC will be exporting ever more coal to China – and ramping up its extraction of oil and gas as fast as it can. The high prices that peak oil produces continue to promise tempting returns. And, as long as the externalities can be bargained away, we will continue this short term, disastrous trajectory. Cap and trade and carbon capture are part of the showmanship. Neither will make any difference – except for the few smart alecs who will make fortunes – and mainly from government spending, while all the while they will decry the depredations of “big government”. In times like these, arguing about transit’s ability to attract riders from former car users, is ridiculous. We knew what needed to be done twenty years ago and we did not do it. We are not doing it now either, and are unlikely to do anything else in the near future. But we will make a huge song and dance about not burning garbage and reusing shopping bags. And continue to elect charlatans like Gordon Campbell. In 2008, Port Metro Vancouver had revenue of $140-million and a profit of $40.4-million. The money is pumped back into port facilities. The operation is a standalone corporation overseen by the federal Minister of Transport. And that is a bad year. Of course, the Port does get government support – lots of it. 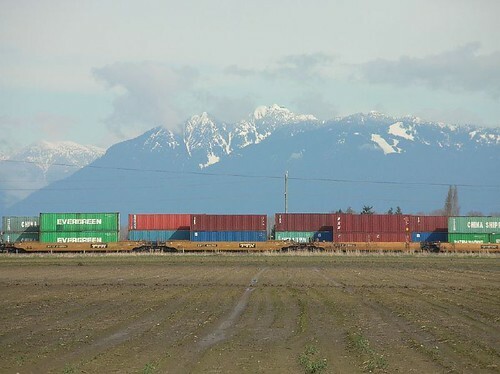 starting with an injection of $225-million from governments, the port and businesses to build two overpasses for railways to replace level crossings on the North Shore of the Burrard Inlet, as well as improving several roads for truck traffic. Governments that were responsive to the priorities of their citizens would not be doing that first. They would be ensuring that schools had enough money to keep their buildings safe for children to be in. Or keeping all kinds of essential community services going – like support for women suffering domestic violence. Or maybe keeping operating rooms going so that “elective surgeries” – like replacing arthritic hips and knees – would not be postponed. Traffic of containers that carry an array of consumer goods and other products is down 16 per cent this year. That’s a slight improvement compared with the 20-per-cent drop seen in the first months of 2009, during the worst of the recession, but Mr. Silvester doesn’t see activity gaining much steam. The full-year decline is estimated at 12 per cent. The Port of Los Angeles, the West Coast’s busiest destination for containers, saw container traffic fall 19 per cent in August compared with the same month in 2008. That is worse than the 16-per-cent decline for the year the port has seen so far. Other indicators such as the Baltic Dry Index, a barometer of ocean freight rates for bulk commodities, also suggest the trade outlook is tepid. The index is closely correlated with the health of the global economy. After crashing last year, down 94 per cent to a low of 663 points, it recovered to about 4,000 in June. Since then, the index has slid steadily and now sits around 2,250.
the port is running at only about half capacity for containers. The Tsawwassen First Nation recently got government aid to cover their bit of the ALR in concrete for container storage. They think they are going to make money that way – but given that the port is only at 50% capacity that seems unlikely to me. The article also points out that this trade is for Canada – very little is destined for the US. Which is probably just as well since our economy is not quite a collapsed as theirs is at present, though of course our economies are indeed inextricably linked. Except for the expense of US recovery funds of course. The future is looking very different to the period of boom that preceeded the recent crash. The recovery is going to take a while, and when it does it will have to take account of the realities that the Bush administration denied – like global warming and the increasing reluctance of foreign investors to hold US debt. Our dependence on imported food is also something we need to start changing. Paving over farmland is going to look exceptionally stupid when food from elsewhere gets prohibitively expensive and we are still waiting for the trans pacific container trade to pick up. Sarah Mirk in the Portland Mecury covers the history of freeway expansion and contraction in the city that wants to become America’s greenest. While other American cities have built, built, built, Portland’s freeway history is boom and bust: massive road projects were planned, mapped, and sold as progress by one generation, then killed by another. When current transit planners visit from exotic Houston and DC to admire Portland’s progress, what they are really admiring are the roads not built—freeways erased from the maps decades ago. What struck a chord with me this morning was that she quoted Robert Moses, who was called in to Portland to design their first freeway plan. I happen to be reading “Wrestling Moses” at present, which describes the epic battle between Moses and Jane Jacobs. Quite extraordinarily Moses lost that battle – and a vibrant Manhattan we see now is the evidence of the extent of his failure. There was, when I first came here, an odd sort of self congratulation. Vancouver was always very proud of stopping its downtown freeway – quite rightly. 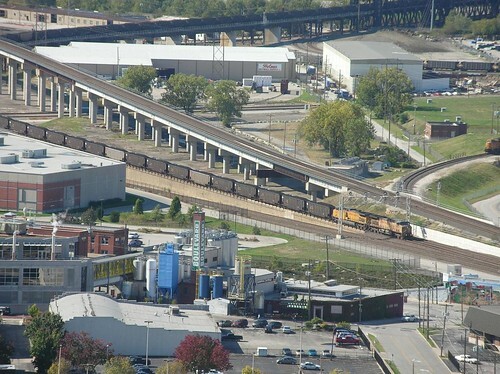 But the rest of the region – and indeed the north east corner of the City itself – is carved up by freeways. And while the roads lobby often recites the myth that “nothing has been built in twenty years” there was a steady pressure of stealth expansion – the addition of HOV lanes – and constant manoeuvring to ensure that nothing should get in the way of the traffic or the plans to build even more freeways. In fact expansion has been significant since the LRSP was signed with lost of piecemeal “improvements”and now the addition of the Golden Ears Bridge, the expansion of the Sea to Sky and now the major building projects on Highway #1 and the South Fraser Perimeter Road. None of these are in the City of Vancouver itself – but that is sophistry. We remain, as a region, dominated by automobile use. The rate of spending on roads has always greatly exceeded that for transit – and other modes – and the share of trips remains almost constant. Portland also is threatened by a major bridge expansion “the current six-lane I-5 bridge to Vancouver will become a 12-lane, $4.2 billion bridge called the Columbia River Crossing (CRC)” just like the new Port Mann. And, of course, the same is true here. What seems to be different now is that those in power no longer fear anti-freeway movements. They have learned a lot from the success of Jane Jacobs in organising neighborhoods – not just in Greenwich Village but in Spadina too. Whatever restraints were built into the old processes have been removed. There is still a lengthy process, with much show of “consultation” and “extensive studies” but the end result was never in doubt. Proponents could claim very early on that is was all a “done deal” because they had already ensured that no other result was possible. It did not matter what the consultations heard, or what was in the studies, because there was no way to stop the project. Which, of course, was what the “elite” had long ago decided. Canada in general now seems to be completely out of step with the rest of the world. Peak oil and global climate change are now widely accepted realities. Most countries – even the United States – recognize that business as usual is not an option even as they continue to argue about who should go first and how much should be done. And the people who run large multi-national corporations, who have been practising deliberate deception on these issues, even seem to be reluctantly accepting that their business model needs to change. But somehow, BC seems to believe that the very real constraints of finite fossil fuels and the capacity of the atmosphere to absorb ever more carbon dioxide do not apply to us. You might have thought that the loss of the forest industry to the pine beetle and the loss of the salmon fishery – which is primarily due to open net fish farms – both in recent years and both on the watch of the present administration – would at least introduce a note of caution. On the contrary, it actually seems to have encourage them to speed up the process. The P3 contract for the SFPR is not yet signed yet the “pre-construction” activity rushes on. The first pilings for the new Port Mann Bridge had to be put into the bed of the Fraser before the election, even though the project financing had completely fallen apart. All kinds of things – really important things that the BC Liberals promised were sacrosanct a few months ago like healthcare and education – are now being cut. But nothing it seems can stop the freeway juggernaut here. When these new freeways open they will be eerily quiet. For one thing, the expectation that port expansion will bring vastly increased trade to Vancouver now seems very unlikely. Though no doubt the current flow of coal from Wyoming to China will continue and probably increase, that, of course, moves by rail. Gasoline is going to be very expensive – and the trivial impact of “alternative fuels” is unlikely to change that very much. Indeed, many of them depend on much higher prices to make them viable. As long as we follow the current economic philosophy that tries to keep wages and salaries as low as possible, and direct any and all benefits to only the wealthy, it is unlikely widespread car use will continue to be possible. Of course, it also likely that some will remember the wisdom of Henry Ford. He broke with other early twentieth century capitalists and paid his workers decent wages so they could afford to but and rive the cars they built. Writers like Howard Kunstler project that current trends in the US suburbs will see them become wastelands, but that, it seems to me, ignores the huge political debt that the current hegemony owes to suburban voters. These were the people who, in BC, decided that Gordon Campbell was the only leader to be trusted with the economy. Many left wing critics south of the line are disappointed with the lack of change in Washington since Obama was elected. That, it seems to me, reflects the reality of power. The ballot box can only do so much – and even then can be greatly influenced by the availability of lots of money. It is more than likely that we will see a lot more building in the suburbs – preferably as close to the new freeway capacity as possible. A lot of farmland and green zone is going to be lost to subdivisions, office parks and shopping plazas – which is all that a lot of the development business understands. A few brave souls will make a point about green roofs and triple glazing, and driving a hybrid, but none of that will make very much difference. Any more than the hideously expensive carbon capture and storage will reduce the impact of the tar sands and the gas shales. The saddest thing for me is that it need not work out like this. There is plenty of evidence now that denser, walkable neighbourhoods and really good electric powered transit produces very desirable places. That it is not that hard to produce a spread sheet analysis that will convince any investor that developments that reduce energy use are going to produce attractive rates of return as energy prices rise. It is also indisputable that a healthier society that is physically more active as part of daily life – when human power is a much bigger part of the energy used in transportation – reduces the biggest growing burden North America faces – health care costs. Is it too late to save much of the river delta? Complacency is certainly not going to help as the sea level rises. Brad Killburn in the Richmond News presents some intriguing information about how helmet laws got through the legislature. The article is full of useful data – but sadly none of it is properly cited or referenced, so I have not been able to identify his sources or check them for myself. It does indeed seem likely that cycle helmets do very little to reduce fatalities of cyclists involved in collisions with motor vehicles. The bike hemet is after all mostly a thin plastic shell on styrofoam. what the honourable members did not know was that it was collisions with motor vehicles that caused virtually 100 per cent of the cycling deaths, and that the study used to show reduction of head injury did not include a single collision with a motor vehicle, or any involving cycling adults for that matter, but merely simple falls by children from their bicycles. I think he should have identified the study sufficiently to help his readers follow up if they wished to. 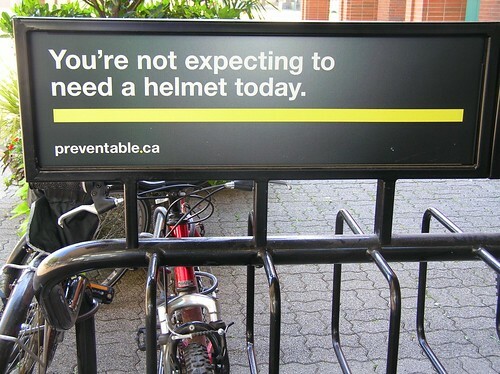 I have heard many people argue that helmets save lives – including former Vancouver Councillor Dr Fred Bass. I have equally heard a lot from advocates who say that helmets simply convey the message that cycling is dangerous, but do little to reduce its risks, and that cyclist fatalities will start to fall when more dedicated cycling facilities are provided. The ticketing of cyclists without helmets is an especially controversial practice, given the lack of evidence that it actually does any good at all. Federal money in Canada does not come easily. It comes with conditions and a timetable. In this case infrastructure spending intended to boost the economy was authorised for only “shovel ready” projects that could start straight away and get the money spent, so that the stimulus could be felt quickly. But in “in British Columbia, … less than 25 per cent of the estimated $1.04 billion in available matching federal-provincial funding [has been] committed to projects so far.” And the UBCM doubts that the province will get its act together in time to get the rest. The BC Liberal Party ran its last election campaign on promises of spending – indeed much government money (not party funds) was spent on signs all over the province that appeared just before the start of the campaign to trumpet its pet projects – such as the Gateway. They also claimed that they were the only party that could be trusted to run the economy. Their earlier claims to be concerned about the environment being much muted. What is striking about the present situation is how disorganised they are. They try to claim that they were taken by surprise by the size of the deficit – orders of magnitude greater than what they claimed at election time. And as if to show how genuine that suprise is, announcements about cuts are made – and then countermanded. And ministers bluster to tv cameras about “tough decisions”. This one should be really easy. Any child with a grasp of 1st grade arithmetic could do these sums. Provincial officials, meanwhile, say they are working hard to find a way to match federal dollars in a year dominated by a dramatic economic decline. I do not see what is hard about this. The rate of return on capital employed has always been very much higher for basic patch up jobs – like fixing holes in the road or repairing crumbling sewers – than new build. The main reasons being that repair is usually much more cost effective than new build, and it also eliminates that very high cost of making good after a catastrophic failure – such as the recent spate of floods in California due to ancient water mains failing. All the BC liberals have to do is cancel some of their dafter pet projects. For a start, theres $100m set aside for gating Skytrain – a project not yet started, not likely to ever recover it costs and one that carries no downside if it is cancelled. Calling a halt to the SFPR and widening Highway #1 would be a bit more embarrassing, since somehow these got tagged with the “stimulus” fad too – but saves billions. Both will be white elephants once completed – since the previous economic model of running America on credit to buy cheap imported goods no longer works as their credit is no good now – and the cheap oil to run all that will not be around either. They were supposed to have been funded by P3s – and thus less of a drain on government – but that is not happening. So it should be simple to cancel them just by saying they were never budgetted in the first place. But the greatest savings are simply to end the subsidies thrown at oil and gas. That way these important resources will still be there when prices recover and more government revenue can be earned from them. Trying to accelerate their development when prices are low is stupid. The sheer level of incompetence on display in Victoria is maddening. How the wool was pulled over so many eyes seems now to be fairly obvious. What is less easy to see is what the rest of us can do about it. For we seem to be stuck with these clowns for another four years.